I found a website (virtual Atari) where you can play a large number of Atari games for free, and I took a snapshot of Adventures of Tron! flynn1978 Wrote: I found a website (virtual Atari) where you can play a large number of Atari games for free, and I took a snapshot of Adventures of Tron! Tron Deadly Discs is also there....They have the Telegames cart version that is only titled "Deadly Discs". It's not actually TRON, but you'll also want to check out "Warring Worms." It's 2-player only. Cursors control one and wasd controls the other. You'll catch onto what it's about really quick. Limited color palette? I can't rightly remember how many colors ATARI could display at once, and what those colors were, but it was pretty limited. 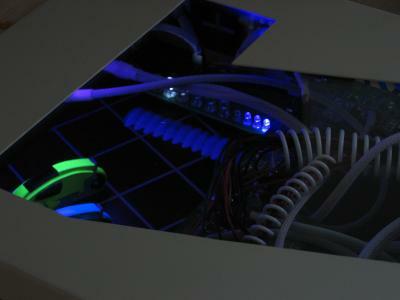 It really needs to be made UVreactive though and a couple of cold cathodes put in. That'd give it a real arcade cab feel. What my twin Flynn1978 was referring to, earlier, was me. I'm a game programmer, CEO & owner of ABOG Games, which has been flying under the radar. I can include the TRON gamesprites from this board if people WANT them in my remake of Adventures of TRON. I won't included them unless given specific permission. Right now I've got 10 freebie mini games & mouse toys I'm actively developing for ppls on another forum entirely. In between that, my image editor which is at critical mass now, a 2 hour job now takes 5 minutes. I'm developing my own original sprites, using both the arcade sprites as bases. Think of the size of Flynn, from Discs Of Tron, running around on a remade 2600 Adventures of TRON playfield and levels. My stuff is Windows EXE files, all the support files such as graphics and sound effects are contained internally, so each mini game or mouse toy I create is very portable. Between the 10 mini games I have in production right now, I'm working on the Atari 2600 Adventures of Tron remake in Arcade quality graphics from Discs of TRON. Also, I'm adding a feature to my custom personal paint program to recreate perfect stand-ins for Atari 2600 game sprites. The technical description of a Atari 2600 player missile or ball sprite can be shortened down to this.